Life is too short to get into a cold bed on a winter’s night. One easy solution to this is to buy a super comfortable heated mattress pad. It will change your life, but how do you choose the best one for you? There are a few things to keep in mind when trying to find the best options. We have searched the web, read all the reviews, checked the customer feedback and listened to the experts and these four models are the best-heated mattress pads that you can buy. An electric pad heats up in the same way as an electric blanket, but you attach it directly to your mattress like a fitted sheet, so the bed heats up from underneath rather than from above like an electric blanket. Having the heat come from below can be very helpful for those with chronic back problems, arthritis or fibromyalgia. There are other advantages to using a pad over a blanket: they are more energy efficient, you can use your preferred blanket type with them, and you don’t have to worry about kicking it off in the middle of the night. First and foremost, if you start reading reviews, you see a lot of complaints about pads not working initially or they stop working within a few weeks. Unfortunately, as with other electrical products, sometimes things don’t work. Heated bedding generally tends to have a high number of defective or faulty products, so it is essential that before you buy you make sure you are fully aware of and understand the return policy and the warranty of the device. The vast majority of buyers get a great fully functioning product, but for the few who don’t, they need to be prepared. If you buy, check the warranty and register it in the manner that is described in your manual. Since mattress pads aren’t cheap, it is worth taking a few moments to protect your investment. It is also crucial that you try out any electric bedding as much as you can within the window of the return period. It tends to be easier to return a product to a store rather than trying to get a manufacturer to replace it under warranty. So keep that in mind. When shopping around for different models, you may find the price to be a little bit high, however, remember that you will save money over the long term on reduced heating costs. Which is better an electric blanket or a heated mattress pad? If you can’t decide between buying a blanket or a pad both have positives and negatives to consider. Are better for those with chronic conditions like back pain or fibromyalgia. You can use whatever blankets you want with them. Some models have zones you can customize, which are great for people who only want to heat specific areas like the feet, or back. If you get too hot, you can remove the blanket instantly. It comes down to whether you would rather lay on something warm or be covered by something warm. When you know the answer to that, you will know which one to get. Ensure what you buy is the right size for your bed. Ensure sure the cord is not stuck between the box spring and the mattress. Only use one heating device on the bed at one time. Do not use an extension cord all heated bedding should be directly connected to a 110-120 volt outlet. A lot of consumers are also concerned over electromagnetic fields (EMFs) that are associated with heated bedding. There were a few early studies that showed a link between exposure to EMFs that might lead to some cancers, but more recent studies have found no link. 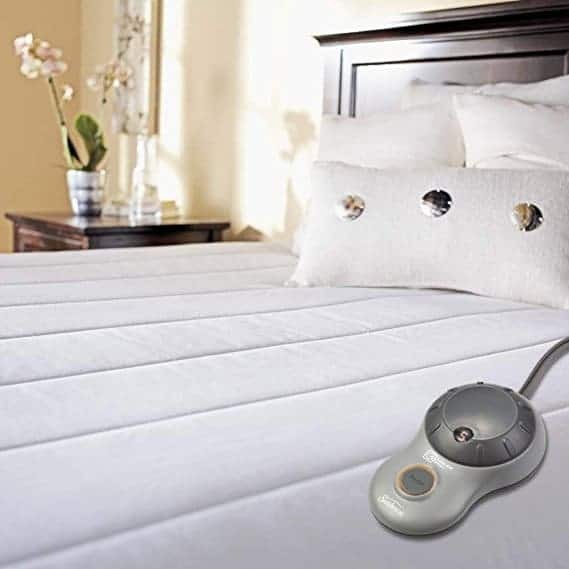 If you want to use electric bedding but are worried about EMFs, a company called Perfect Fit Industries have a brand of low voltage heated bedding that most experts agree are the safest choice if you are concerned about cancer risk. Who should not be using Electric Mattress Pads? Most people can use this type of electrical device with a few exceptions. Manufacturers of heated bedding recommend that infants, young children, people who are disabled, paraplegic, quadriplegic, diabetic person, anyone insensitive to heat or who cannot clearly understand the instructions and operate the controls do not use their products. If you use an oxygen tank, you should also not use heating bedding in case the control boxes throw sparks. If you are pregnant, you should check with your doctor, although if you are worried about safety, you can use the mattress pad to warm up the bed and then shut it off when you are in bed. Will you feel the wires? One of the biggest complaints about electric pads is being able to feel the wires as you are laying down. It tends to be more of a problem for some of the lower cost or older products. The cables that are used these days are much thinner than in previous generations, so as long as you purchase a good quality product, you will not feel the wires coming through the fabric. A few users find that they can feel the wires for the first few days, but then they get used to it and stop noticing them. 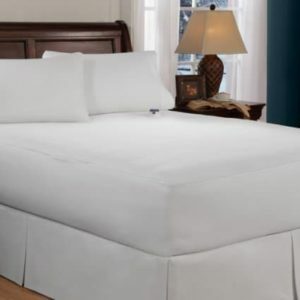 As long as you follow all of the care and washing instructions (and haven’t received a faulty product) your mattress pad should last around five years. Some manufacturers offer a five-year warranty, so, for the most part, you should get a good number of years out of the pad, the controller function, and the fabric. Waterproof- It is a good idea to consider getting a pad that is waterproof, especially if you are in the habit of drinking any liquids in bed or if there are any bladder control issues. Auto-Shutoff- Any model that you select should have a shut-off mechanism to prevent the blanket from overheating or catching fire. 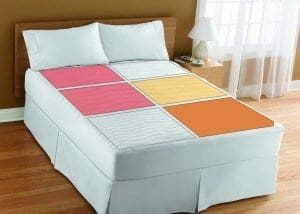 Length of power cord – Since you have to plug the mattress pad into an electrical socket, the position of where it connects into the mat as well as the length of the cord may have some bearing on the product you select depending on your room setup. You are not supposed to use extension cords with heated bedding, so be aware of that when making your selection. The number of heat settings – The more heat settings that are available, the more ability you will have to customize the heat to your personal preference. You will probably want to get a device with at least ten heat settings. Low Voltage- There are a few electrical bedding products that use the low voltage of 12 to 24 volts, that you can plug into your regular home electrical outlets. A lot of consumers are worried about exposure to EMFs due to some studies linking exposure to EMFs to some forms of cancer. If you get a low-voltage model, it will include a small power supply box that changes the 120 volt AC of your home current into low voltage DC (kind of the same way a battery works). Machine Washable– Of course, you will want to wash the mattress pad at some point, so ensure that it is machine washable and that it doesn’t shrink, changes in color, or pill when washed. Safety – All electric bedding on the market have to meet stringent safety rules. Make sure you are only buying a device that complies with all electrical safety standards for electrically heated bedding. They need to be UL listed. Digital or analog controller– The controllers come in two types. You can either get an analog, which means that it has a dial to adjust the heat level. Or you can get a digital controller, which means that you have to press a button to change the heat level. Generally, people find the dial to be easier to use in the dark. Auto-dimming feature – If you get a product with a display that has an auto-dimming feature it will be more convenient for night time adjustments to the temperature. When buying heated bedding, it is essential that you buy from a company with an excellent customer service reputation. You will want to avoid any companies that don’t honor the warranty, make it hard to get replacement parts and are hard to get in touch with. Sunbeam: Sunbeam has put all of their instruction manuals on their website (in case you misplace yours). You can contact customer service through a form on their site or by calling 1-800-667-8623(U.S) or 1- 800-667-8623(Canada). Replacement controllers can be ordered by contacting customer service. Electric mattress pads are useful for many different reasons. While the obvious use is to keep you warm in colder weather, there are other benefits as well. Since heated mattress pads have an electrical component, it is essential that you read and follow all of the instructions in the manual. You need to examine the wiring and the controller regularly to ensure there is no damage or signs of discoloration. If you do find any signs of damage, you should stop using the product immediately. Be sure to read the cleaning and washing instructions carefully before washing your pad. They tend to have a fair number of warnings when machine washing, so it is advisable to read through these to avoid any damage to the wires and to take all safety precautions. 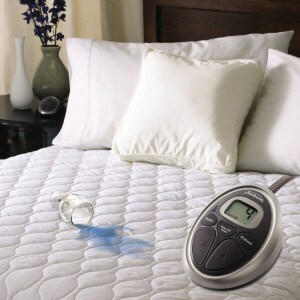 The heated bedding products that are available today are an excellent addition to your bed on a cold winter night. They will keep you warm, help with sore backs or muscles, they will help you sleep longer and better and will save you money on your heating bill. They can be a little pricey upfront, but it is worth buying a quality product that will save you money in the long run and keep you comfortable and happy.